The weather was extremely nice last week, so Peter and I had a picnic at the park. 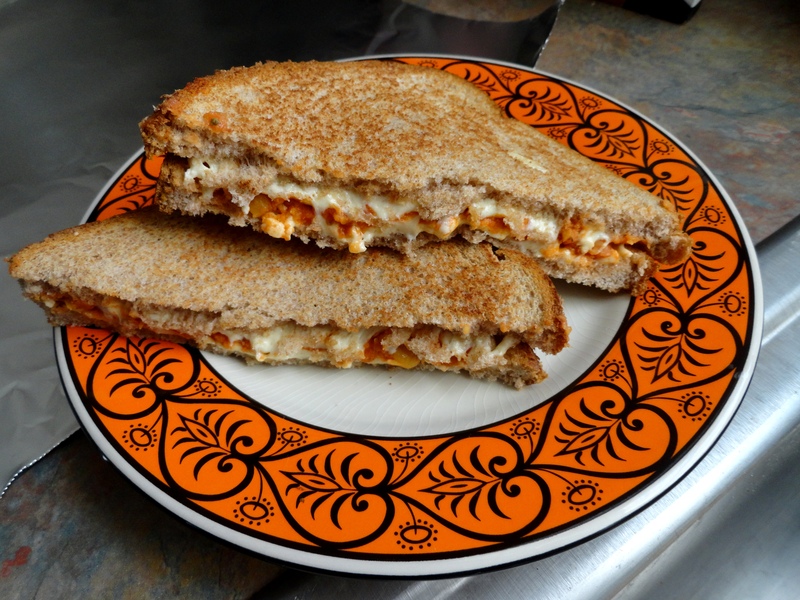 There we munched on these grilled pizza sandwiches (which had pizza hummus and Daiya inside) and cucumber slices dipped in Italian salad dressing. I made a batch of Mom’s Chili, which I ate with crackers. 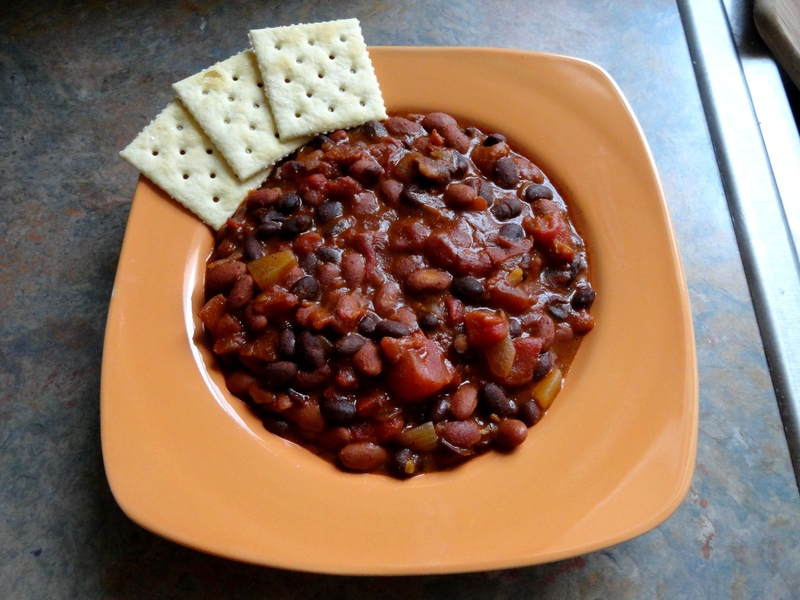 I skipped using canned beans though, and cooked up some dried black beans and red beans the day before in the slow cooker. Then I mixed them with the rest of the ingredients to make the chili. The next day the leftover chili was turned into a “Frito pie”. 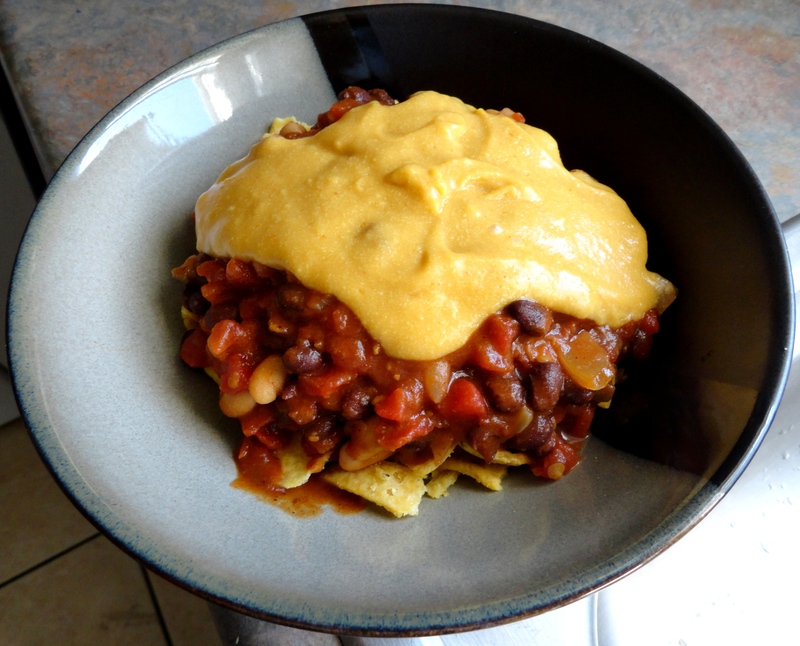 With layered crushed Frito corn chips and chili then smothered in healthy cheese sauce. Tomato-rosemary scones from Vegan Brunch. I’ve actually never baked scones before, but these were extremely easy to make and very delicious. My favorite way to have these is warmed up with a pat of margarine in the middle. 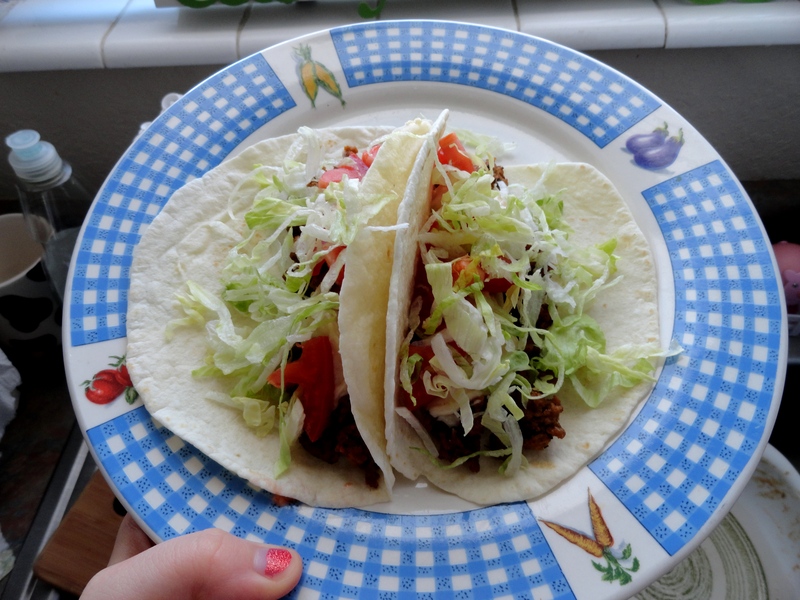 Soft tacos with Upton’s Naturals chorizo seitan, Daiya pepper jack, lettuce, and tomatoes. It was my first time trying the Upton’s seitan. I really liked the taste and texture of it, but the small amount of seitan per package for a fairly high price (at least at my local Earth Fare) was not worth it. 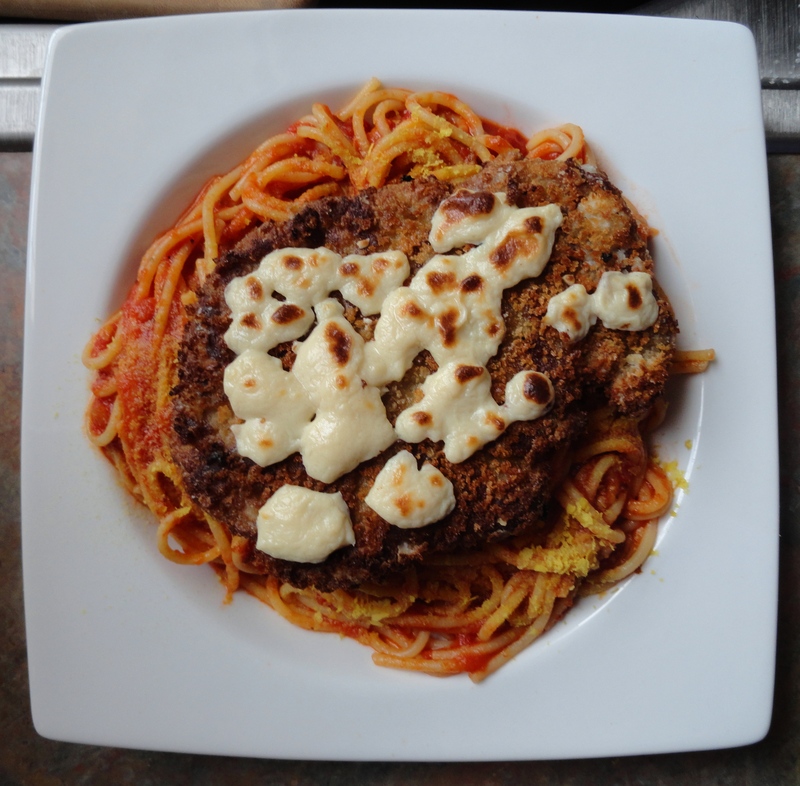 “Chicken” parmesan, made with soy-tan dream cutlets from 1,000 Vegan Recipes (which I breaded and pan-fried), with melted Daiya mozzarella, all on top of spaghetti in a creamy marinara sauce, and sprinkled with nutritional yeast. 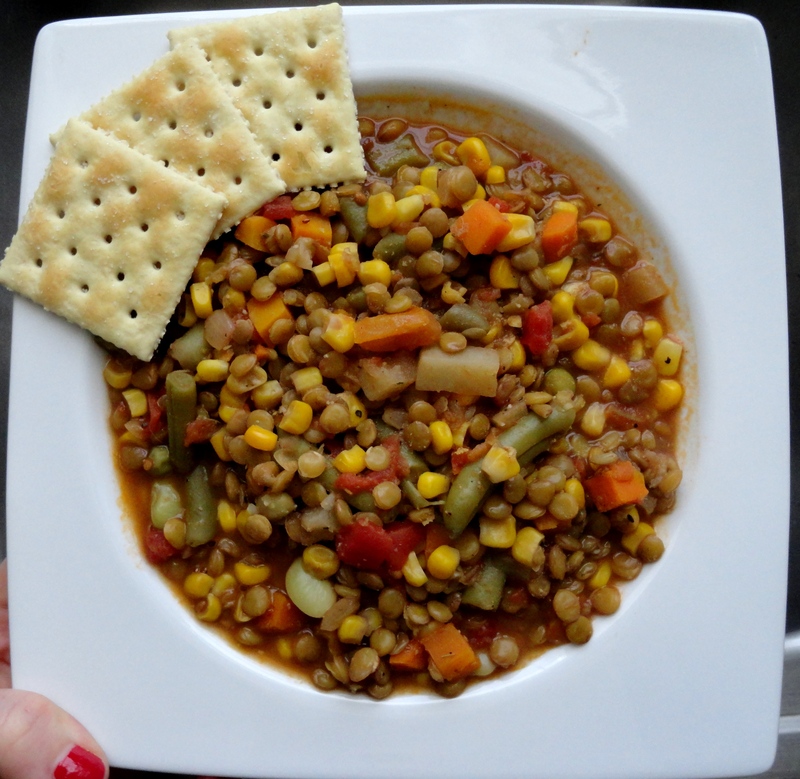 Lentil and veggie soup, which I mostly made because I needed to clean out my refrigerator’s produce drawer. It has lentils, onions, corn, carrots, tomatoes, green beans, peas, potatoes, and lima beans which were all cooked in a garlic tomato broth. For our three-year anniversary, Peter got me (along with a few other things) The Unofficial Game of Thrones Cookbook. I’m a big fan of the television show and hope to begin reading the books soon, so I was super excited to have these recipes based on the series. 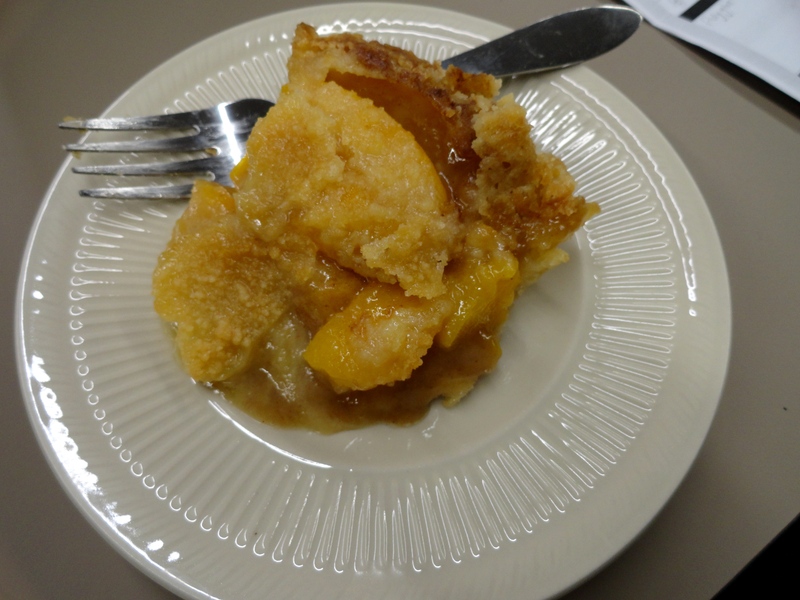 Our local gaming group is actually starting a GoT roleplaying campaign, so for our session I made Arya’s Apricot Tart to share. Except there are no fresh apricots available around here, so we settled for peaches. To veganize the recipe I subbed Earth Balance for butter, coconut milk for heavy cream, and I used this recipe for the crust. 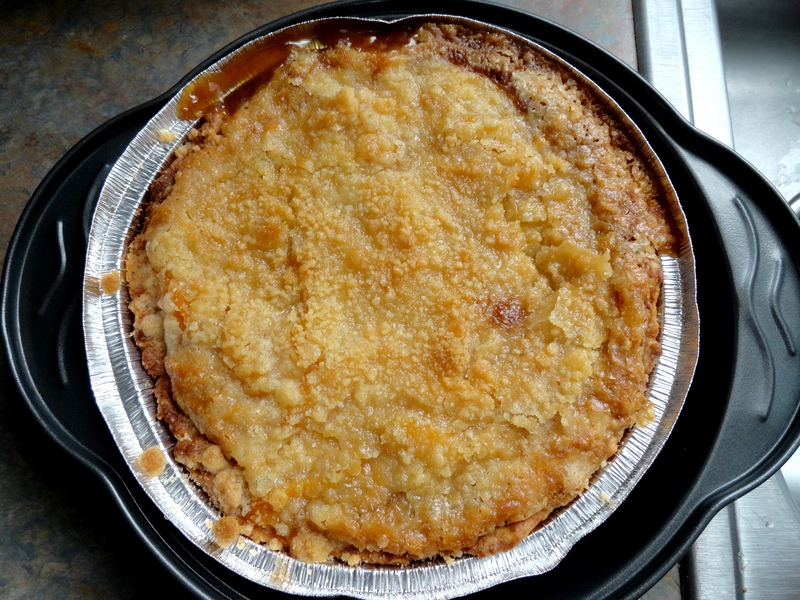 It turned out delicious with a flaky crust, juicy peaches, and buttery crumble topping. I can’t wait to try more recipes from the cookbook. 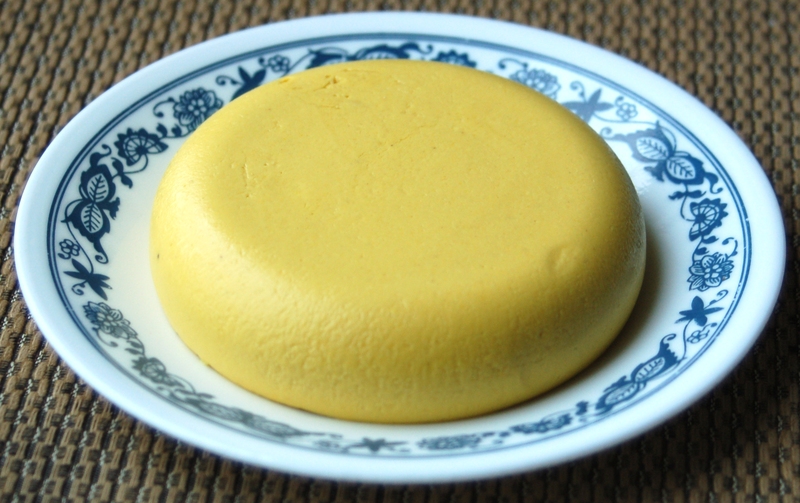 This week I finally bought some agar powder and attempted to make some uncheese from The Uncheese Cookbook. 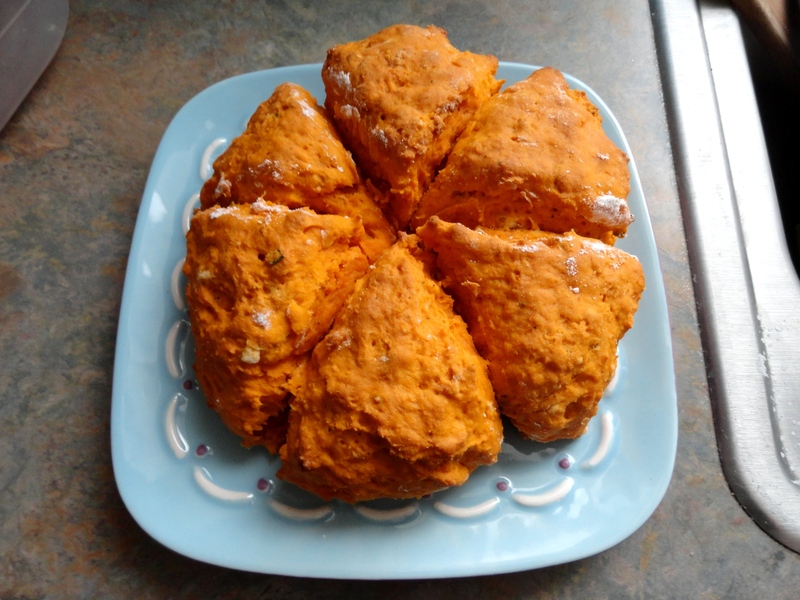 I tried making the gooda cheez and it turned out surprisingly good! It took less than 15 minutes to make the cheez, not counting the few hours taken for it to set up in the fridge. It had a nice, creamy texture and taste. A bit strong on the mustard when eaten by itself ( Well what do you expect when you have Dijon mustard and dry mustard in the ingredients?). But it was delicious when paired with crackers, or stuffed inbetween two pieces of wheat bread and topped with some freshly sliced tomato. 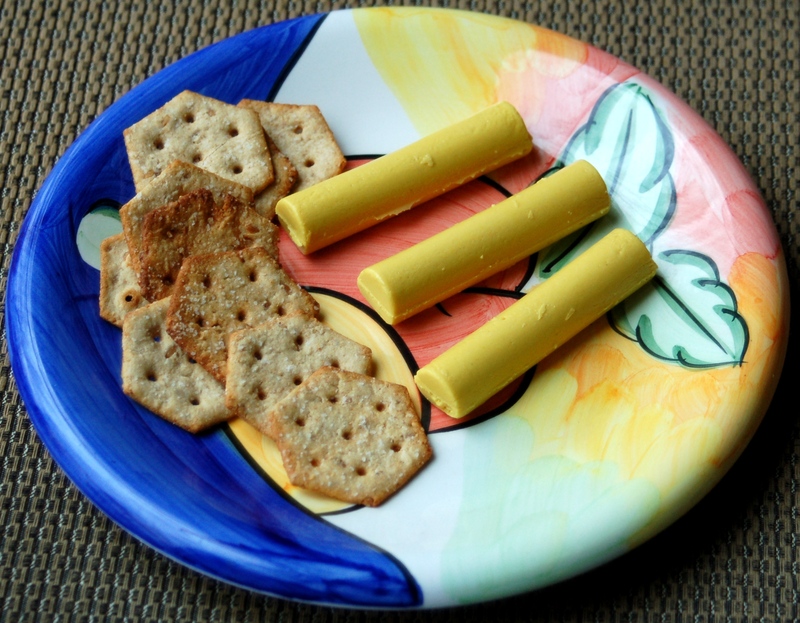 I used half the cheez mixture to make a block, but the other part to make cheez sticks. I poured it into an ice stick mold and out came the lovely sticks pictured above! They were very yummy and just the right size to snack on with crackers. I will most definitely make this recipe again, maybe next time we have guests over so I can share it with the omnivores!